Shea is a ten-year-old girl who takes trouble-making to extremes. How others perceive her behavior doesn't bother her in the least as she seems to derive great pleasure from her antics. She is so notoriously bad her family has decided an intervention is in order. Then one day she thoughtlessly squishes a bug. Not long after, she meets Webster, a bespectacled eight-legged spider, and ambassador of the Grass Kingdom. 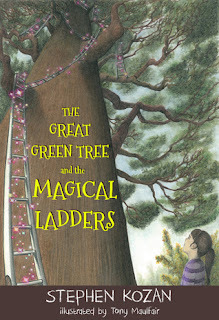 She soon discovers that the tree in her backyard is enchanted. She also learns how her thoughtless actions have hurt the family of the bug she killed. The concepts of responsibility, bullying, generosity, lying, forgiveness and respect are introduced in an entertaining and engaging manner. Children will enjoy the adventure provided in this wildly imaginative book while parents will love the positive values introduced within. The Great Green Tree and The Magical Ladders is a lovely tale filled with delightful talking insects and birds. This is a book to read and enjoy again and again.